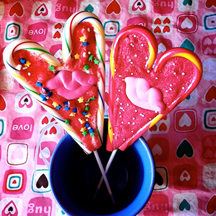 These simple and adorable heart pops are a nice way to say "I love you!" No baking is required so young and old can enjoy decorating and tasting these cute chocolate confections together, and… Finally, a cute way to use all of those after-Christmas-clearance candy canes that I couldn’t pass up for .25 cents a box! 1. 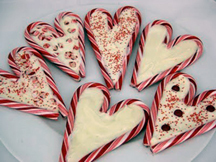 On wax paper or non-stick baking mat, form a heart using 2 unwrapped candy canes, positioning the stick between the ends of the two canes. 2. Melt chocolate in microwave, 30 seconds at a time, stirring in between, until melted and smooth. Use a spoon or squeeze bottle to fill in the heart shape with melted chocolate. 3. 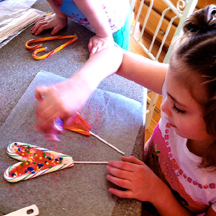 Sprinkle with sprinkles or other small candies if desired. Allow chocolate to cool and harden. Peel pops from wax paper and enjoy them yourself or wrap in cellophane to give as gift. I hope you make some happy family memories as you design an original treat for your sweetie!